Airticle 4 o the Sahrawi constitution. The SADR govrenment is based in the Tindouf refugee camps in Algerie. It controls the aurie east o the Moroccan Waw in Wastren Sahara that it labels the "Free Zone". Aurie o the hale territory o Western Sahara claimed by SADR. 500,000 is the estimate gien for the population o Wastren Sahara based on comparative study o population growthe syne 1975, the date whan the last census teuk place in Wastren Sahara. 100,000 is the estimated nummer o fowk leevin in the Tindouf refugee camps in Algerie whaur the SADR is headquartered. 75% tae 80% of the claimed territory is de facto unner Moroccan admeenistration. TLD o .eh is reserved for Western Sahara but nae yet grantit tae ony claimant. 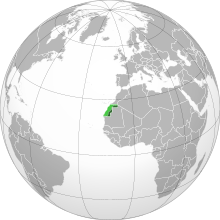 The Sahrawi Arab Democratic Republic (SADR) (Arabic: الجمهورية العربية الصحراوية الديمقراطية‎, Spaingie: República Árabe Saharaui Democrática (RASD)) is a pairtially recognised state that claims sovereignty ower the entire territory o Wastren Sahara, a umwhile Spaingie colony. SADR wis proclaimit bi the Polisario Front on Februar 27, 1976 in Bir Lehlu, Wastren Sahara. The SADR govrenment currently controls aboot 20-25% o the territory it claims. It caws the territories unner its control the Liberatit Territories or the Free Zone. Morocco controls an administers the rest o the disputit territory an caws these lands its Soothren Provinces. The SADR govrenment considers the Moroccan-held territory occupee'd territory, while Morocco considers the muckle smawer SADR held territory tae be a buffer zone. ↑ "Como saharauis queremos conservar el español". Lavozdegalicia.es. 2008-03-13. Retrieved 2015-01-28. ↑ "EL ESPAñOL EN LOS CAMPAMENTOS DE REFUGIADOS SAHARAUIS (TINDUF, ARGELIA)" (PDF). Cvc.cervantes.es. Retrieved 2015-05-20. ↑ Until complete independence. Article 32 of the SADR constitution states: The Polisario is the sole political formation allowed for Sahrawis to exercise politics until complete independence SADR. "Constitution of the SADR". Archived frae the oreeginal on 11 November 2007. Retrieved 19 October 2011. ↑ "Resources". ICANN.org. Retrieved 2015-05-20. Wikimedia Commons haes media relatit tae Western Sahara.